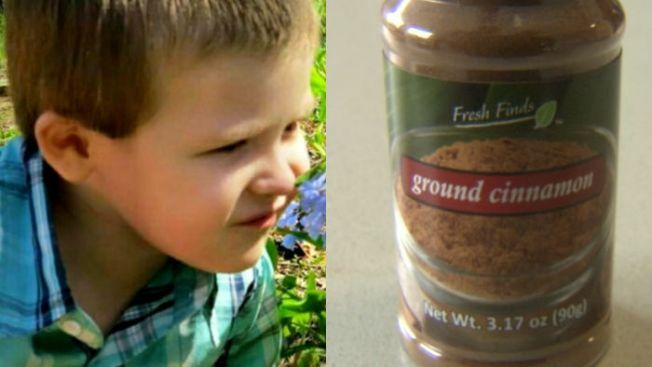 A 4-year-old boy in Kentucky died after he accidentally choked on a mouthful of cinnamon powder, his parents said. Matthew, who liked to climb, was in the kitchen on Wednesday, exploring when he found a bottle of cinnamon and put some of the powder in his mouth, Brianna Radar, his mother, told NBC affiliate WLEX. "He started choking. It was like he was having a seizure and just collapsed," said Radar. He was rushed to the hospital within minutes and doctors worked on him for an hour. They were unable to save him. The coroner is awaiting for an official report to come back but said it's possible to asphyxiate from inhaling cinnamon powder. Speaking to WLEX, Radar mentioned the "cinnamon challenge," an Internet trend where people film themselves trying to swallow a spoonful of cinnamon in under a minute. Radar wanted "to let people know that cinnamon can kill," she said.